With NAB getting closer the new product releases are coming in thick and fast so this blog covers Canon, FUJINON, and Atomos. More dedicated blogs on individual manufacturers and products will be released later. 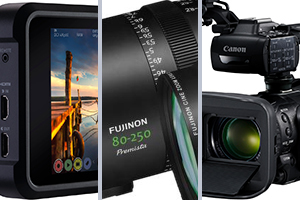 Pre NAB Canon has just announced 5…that’s right 5 new camcorders. This entry was posted in NAB, News and tagged NAB 2019, Atomos Shogun 7, Fujinon Premista series, Canon Sumire Prime Lenses, Canon Legria HF G60, Canon Legria HF G50, Canon XA55, Canon XA50, Canon XA40, Atomos- AtomX, Atomos, Canon, Fujinon on 16th April 2019 by Visuals.